Kim Harker looks for a scoring opportunity. The junior and the Wildcats will be up against much tougher competition this weekend than last. Northwestern has been here before. The Wildcats (2-0) will face their first ranked opponent of the 2018 season Thursday when No. 19 Colorado visits Evanston. 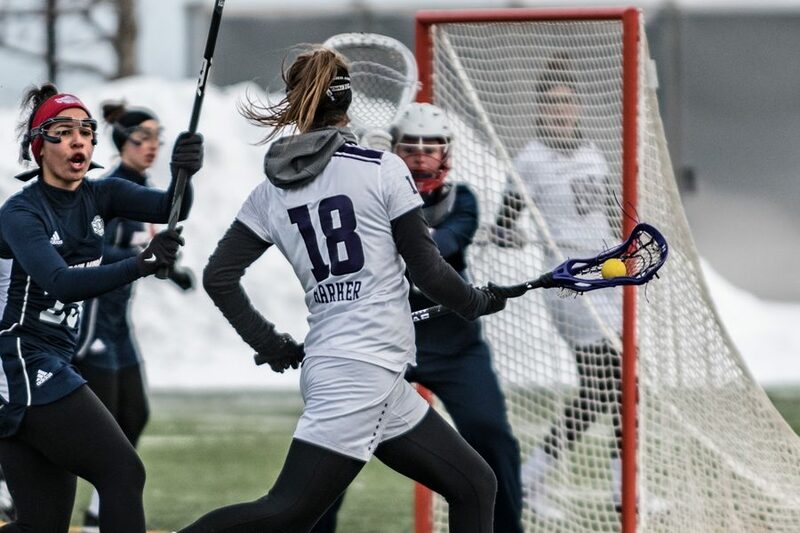 NU is coming off a strong opening weekend that saw the Cats score 18 goals in Saturday’s win over Canisius and 21 in Sunday’s takedown of Detroit Mercy, and will enter Thursday’s matchup as the No. 9 team in the country. The position is familiar. Last season, NU also won its first two games of the year and entered a February meeting with Colorado ranked at No. 9. NU lost 11-10 to the Buffaloes in a rollercoaster overtime match. After that heartbreaking loss, the Cats dropped their next three games, including one to Southern California that also ended in overtime. Coach Kelly Amonte Hiller said she doesn’t see that happening this season. In just two games, NU has already proven that this is a different team than last year’s, which left the NCAA Tournament in a second round loss to Stony Brook. NU had 16 players score at least one goal all of last season; it saw 16 players score across the two games this weekend. Amonte Hiller said the team moved the ball well and finished its shots better on Sunday against Detroit Mercy. NU tallied 13 assists on the day, the most in a single game since March 5, 2011, and scored on 60 percent of its shots. Attacker Selena Lasota made her long-awaited return to the field after missing 17 games last season with an injury. The junior scored six goals and won seven draw controls over the weekend, and was named the Big Ten Offensive Player of the Week. The Cats are now tied for first in the country in draw controls per game (19.0) and sit first in scoring margin (15.0). They’ll face a Colorado offense that returns three of its five leading scorers from 2017, including midfielder Miranda Stinson. Stinson has eight goals in the Buffaloes’ two games thus far and scored a team-high three goals when the teams met last season. This weekend will bring another challenge for NU, as the Cats travel to No. 18 Duke for their first road game of the season. NU has won four of its last five matchups against the Blue Devils, most recently a 12-10 win at home in 2017. Thursday’s game will kick off an important early-season stretch for the Cats: Five of their next six opponents are ranked. For now, Amonte Hiller said, the focus is on Colorado.